Barely a week after declaring the end of the ninth Ebola virus outbreak in the Democratic Republic of Congo (DRC), officials announced another in the North Kivu and Ituri Provinces, in the eastern part of the country. 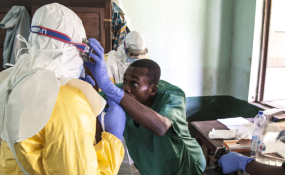 The Conversation Africa's Ozayr Patel spoke to Jacqueline Weyer to found out more about the 10th Ebola outbreak in the country. Where has the outbreak happened and what are the challenges in making sure it's contained? Can the country employ the same tactics it's used before to battle this outbreak? The premise of these efforts is to essentially get ahead of the virus's chain of transmission, and to break it. These methods are still effective and continue to be the mainstay of containment efforts. The vaccine is based on a benign virus that doesn't cause illness in humans but provokes an immune response in the body without causing the disease - we call this type of vaccine a recombinant vaccine. The antibodies produced in response to this vaccination may then protect the recipient when an exposure happens. Ebola is what's known as a zoonotic disease - it can be transmitted from animals to humans. Although the natural ecology of the Ebola virus remains to be fully understood, scientists believe that the virus is naturally found in certain species of forest-dwelling bats. The virus can then be transmitted from the infected bats to other forest-dwelling animals, or to humans. Several outbreaks have been traced back to people who were very likely to have had contact with bush meat. Contact with raw blood and tissues of an infected animal is of particular concern.